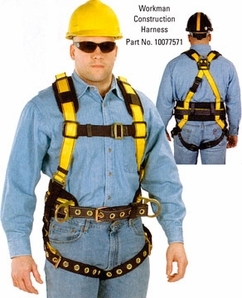 MSA Workman Full Body Fall Protection Harnesses offer comfort and safety at economical prices. Model 1007248 features Qwik-Fit Strap at Chest, Tongue Buckles on Leg Straps, Attachment Points on Back and Hips, Integral Back Pad, Tool Belt and Shoulder Pads. Also available in Size XL.